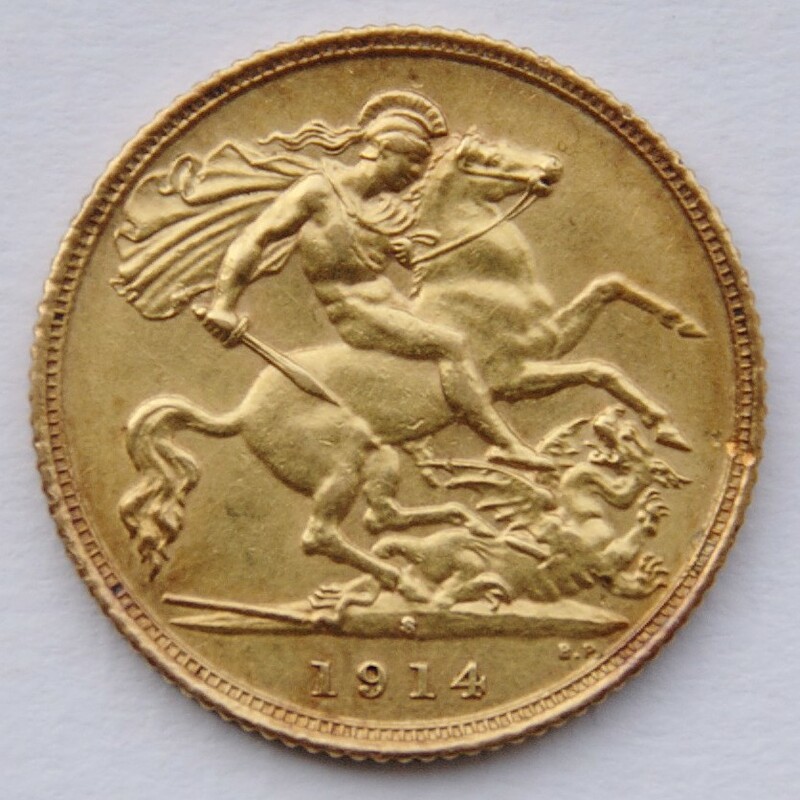 Gold sovereigns are acknowledged as one of the oldest and most recognised gold coins largely due to their attachment to history and tradition that stems directly from the olden days of the British Empire. Weighing exactly 7.98 grams at 22 karats which basically means that the purity level (gold content) in a sovereign is 91.66 % which in turn means; each sovereign contains a net weight of 7.315 grams of gold (approx. 0.235 troy ounces of gold). The recognition for the British Gold Sovereign is unprecedented based on the fact that although most central banks around the world keeps gold reserves in the form of bullion bars that weigh 400 ounces, they also store a portion of their reserves in the form gold coins and the preferred bullion coin is usually the Gold Sovereign of Great Britain. Besides the historical attachment of the sovereign, other factors that contribute to its popularity is the traditional aspect of this coin that is a popular and valued gift at christenings, birthdays, weddings, young individuals coming of age or simply as an attractive token or jewellery piece in its own right. The only setback that the sovereign has is the gold content which runs of into fractions whereas the new breed of gold bullion coins in the ‘same class’ as the British sovereign that made their way into the market towards the end of the 60s such as the South African Krugerrand contained exactly one troy ounce of gold which is easier to comprehend from a mathematical perspective. Although the sovereign is attached to a nominal value of just a pound sterling due to the fact that prior to 1932 the sovereign was actually used for transactions and within Great Britain was a fully circulating coin, it is currently regarded as bullion coin and in some instances some of these sovereign carry more value than their gold content and among the most valuable sovereign are the sovereigns that were struck for Edward VIII who relinquished his positions that resulted in these coins never entering market circulation and one of these coins fetched a hefty half a million pounds at an auction in 2014. Some are rumoured to be valued even higher than that especially English gold sovereigns that were minted in 1604 and those that were minted after the great coinage of 1816 when each of these coins were worth about 44.5 Guineas or £1.05). There were 3 ‘modern era’ minting of the sovereign, the first were the ones minted in the UK itself for 100 years (1817-1917), then again in 1925 and the present ‘mint run’ that started back in 1957. There is no doubt that the sovereign is among the best form of bullion to own as they are recognised and are known to grow in value that sometimes outrun their gold content. However, it is always necessary to have these coins assayed before purchase as some times these coins could weigh less due to handling and ‘chipping’ and due to English law which only recognises a sovereign to be considered as legal tender if the coin weighs 7.93787 g or more, otherwise, it is valued for its scrap gold content by most dealers.